The lovely people at New Look sent me these boots a while ago, but I didn't have time to do an outfit post to show you. So here they are now, looking a bit dirty and worn but oh well! Although I chose them myself, I'm not really sure if they suit my style, I do love the crepe heel though. One thing I've always hated about wearing heels during the day is the click clack sound as you walk, it makes me feel like I'm tottering about, but crepe heels are nice and quiet! This is such a nice playsuit! Love it with the scarf for an extra cosy touch. I'm always surprised by New Look's shoe selection, they actually have some really nice stuff in there. I love these boots. They're stylish, with a good heel size whilst having seemingly good grip which is perfect for our weather! I think they look lovely! Especially with the lace detail, and you're right - the heels look fab. And I'm still yet to find the perfect-fitting playsuit. So jealous! I love the boots and the playsuit is gorgeous! i totally agree with the clip clop sound! I hate sounding like a horse in the middle of the day so generally opt for flats! ooh i love the shoes! and i think they go very well with your style. :) it's cool that you went out of your comfort zone when you bought them anyway, though! Gorgeous boots! I absolutely love how cute this outfit is. Silent predator heels, haha. I'm absolutely loving the playsuit you've got here. All in all, a delightful look! 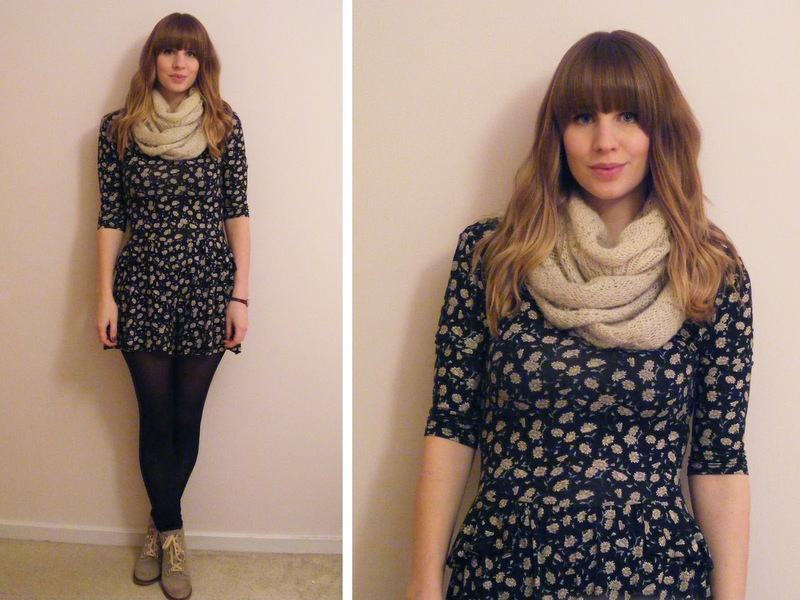 I love everything about this outfit - the playsuit, the scarf, the boots - you look great! I love your outfit! The dress is so cute and awesome shoes!